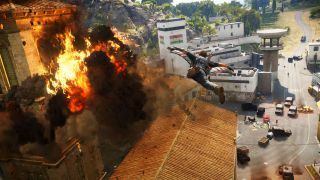 Just Cause 3 director: waiting for gameplay footage will be "worth it"
“We wanted to do everything the right way,” Lesterlin said. “The first time you see it, we want you to say, ‘that’s awesome.’ We can’t wait for that.” The team did show off some new screenshots especially for the PAX crowd but, to be honest, if you’ve seen a man fly a flaming jet into a pile of propane tanks once, you’ve seen every man flying a flaming jet into a pile of propane tanks. Looking for more PAX East news? Check out the tag PAX East 2015 for all of our coverage from the show.